Is it just me or was that Atlanta Hawks v Orlando Magic match-up incredibly painful to watch? I couldn't get into that series AT ALL. Thank goodness they kept that game off of TNT tonight. There is no question that Orlando is worse after the big trade. As a result, any plan to visit the "new" Amway Arena will be postponed yet another year (i.e. at least). As for the Hawks, I like Jamal Crawford and have enjoyed the way he's matured as a player, but without Coach Woodson, I just can't actively support this team. I don't feel like they play inspired basketball. I remember the Joe Johson Craigs list ad. Needless to say, I'm taking the Chicago Bulls in the next series. In contrast to the Hawks v Magic series, I never wanted the Dallas Mavericks v Portland Trail Blazers match-up to end, but all good things... I enjoy watching the Blazers. I like the play of LaMarcus Aldridge. I believe in Brandon Roy and want him to succeed. The games he played AFTER he complained about his playing time showed me that he wanted to EARN his minutes. I think he apologized for going to the media to vent his emotions. I'm glad that he learned that his play speaks for itself. The Dallas Mavericks v Los Angeles Lakers series should be HOT, but I think the Boston Celtics v Miami Heat will be more exciting. I remember the Nike Party during NBA All-Star Weekend in Los Angeles this year. I saw Dirk Nowitzki joking around with Kobe Bryant and flashing him the "L" (i.e. loser symbol). Sure they shared laughs, but you know the saying ~ "There's truth in humor." I'm sure that Dirk and the Mavs would like to eliminate the Lakers. I'm also confident that Phil Jackson would like to leave the Lakers as a WINNER. I don't question Kobe's heart. After seeing the way he looked at Pau Gasol, after Gasol had a few "oopsies" in Game 5, I don't want to get on Kobe's bad side. **** Seriously. If looks could kill, the Lakers would be a man down. As for the eagerly anticipated Celtics v Heat match-up, I really hope that the Celtics manage to "Beat the Heat". Earlier today I read Jay-Z's Life+Times blog post about Chris Bosh. I was irritated on various levels after reading the post. For the sake of completeness, I'll post my comments here. Here are my comments (forgive the capitalization): "people don't like bosh for a variety of reasons. he actually believes he's at a level that puts him in the same category of wade and james. THIS IS SIMPLY NOT TRUE. bosh's perceived bravado, ineffectivenes, crying, and whining are a few of the reasons why he's the subject of criticism. nobody likes a pompous whiner that's unreliable when it comes to productivity. the heat are wade's team. d wade should get the final shot. bosh should realize that it's an honor JUST for him to be "nominated". That's all I have for now. Like I said, I'm already starting to feel the fatigue of the 1st round. In my head, I'm already "on to the next one". **** Oh, and if you're one of those people that watched the NFL Draft today, I really don't know how you do it... After I heard Cam Newton went #1 to the Carolina Panthers, I lost interest. Random thoughts about the Royal Wedding and gingers. 1) As I was watching a re-run of The Hills last night (i.e. yes, I'm that bored), I noticed that Lauren Conrad, LC, resembles Kate Middleton. 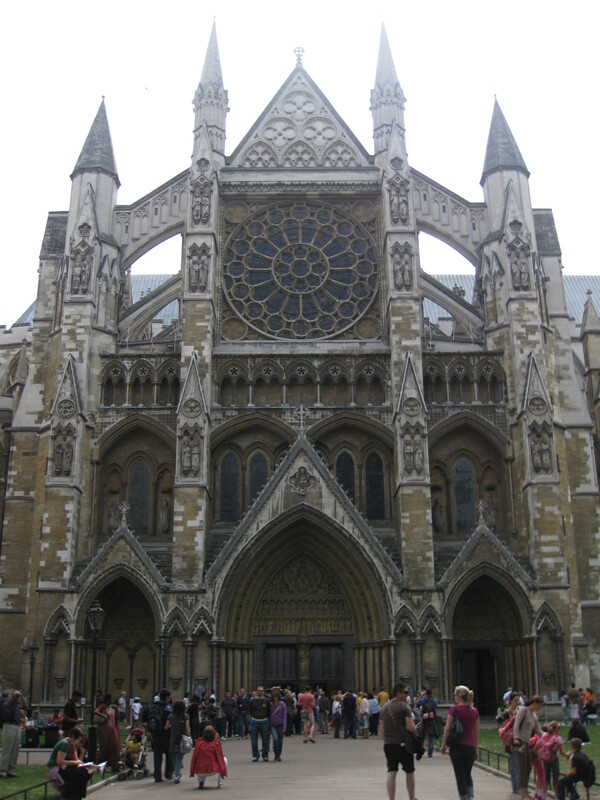 2) I realize that Prince William is going to be King and that we should all be excited aout the impending nuptials. However, I'm more interested in when Harry marries. Now, THAT will be a party! Harry may not be the future King of England, but he is much better looking than his older brother. Harry and Boris Becker are really the only two "gingers" who have ever caught my eye. 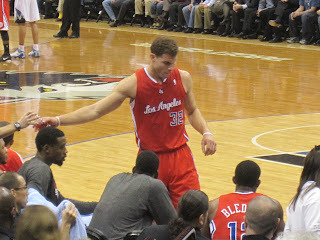 Blake Griffin? No, thank you. It's a slipper slope and next thing you know, you're looking at Delonte West twice... Scary, right? To reinforce this lesson and emphasize the way my brain works, I'll repeat the path: William -->Harry -->Blake Griffin -->Delonte West. I finally made it to the Pepsi Center for Game 3 of the Oklahoma City Thunder v Denver Knicks game (i.e. just kidding!!!). Actually, it's the Denver Nuggets. I couldn't resist making the joke. I arrived at the Pepsi Center early and decided just to park close to the arena for $15. As I waited with other NBA fans til about 6:45PM to get into the building for an 8PM start, the smell of buttered popcorn wafted outside. Yes, I was sold. I bought popcorn the minute I walked in. A girl has to eat, right? Sporting my new Nuggets hat (i.e. less than $20 from the team store) I went to my seat. Everyone in the arena had a light blue Nuggets rally towel waiting for them on his/her seat. Nice. I save those towels and use them as kitchen towels. As I watched the pre-game shoot around and warm-ups, I watched J.R. Smith and his teammates shoot trick shots. Smith's final shot was a full court heave towards the basket and it went IN. Ending on a high note, Smith ran into the tunnel to get ready for the game. **** Who knew this would foreshadow the outcome of the evening's game? As the pregame festivities went on, I was reminded that the cartoon, South Park, is set in Colorado by Cartman on the jumbotron. Too funny! Nuggets fans are passionate about their team. They cheered as the Nuggets battled the Thunder, but there were a good number of Thunder fans present at the game. It was good to see all the Nuggets old school jerseys and T-shirts with "English" on the back. **** I met NBA Legend, Alex English, a couple of years ago during the All-Star break, and he was a nice guy. Whenever I looked at the scoreboard it always seemed as though Kevin Durant and the Thunder were up about 6-8 points. Whenever I looked towards the court, it seemed like either Russell Westbrook or Kevin Durant was talking to a ref and complaining. I like Durant and Westbrook, but nobody likes a whiner. Sorry. I call it like I see it. Maybe that's why BOTH Durant and Westbrook were called for technical fouls. Regardless, the game was a little chippy and there was a good degree of physicality during the game. However, physical basketball and a good degree of banging on the court is to be expected ~ especially during the NBA playoffs. Nuggets fans (i.e. sitting near me in the lower bowl) were convinced the Denver was going to nab Game 3. Unfortunately, for them, this wasn't the case. I disagree with the 4 guys in their 20s who were sitting in front of me. I don't believe that you can blame the Nuggets' defeat on the George Karl's rotation. I believe that you can attribute the loss to the lack of effectiveness from Al Harrington, Raymond Felton, and anyone else who didn't grab an offensive rebound. As the Nuggets fought back to close the Thunder lead, the fans at the Pepsi Center were on their feet. With about 40 seconds left in the game, and the Thunder up about 6-8 points, some Nuggets "unfaithful" started to exit the building. I find it ironic that the girl behind me (i.e. who looked like she was in her mid-20s) was the one who said, "I don't know why everyone is leaving. 40 seconds is a lot time in the NBA." THAT is a girl who knows her stuff. Final thought: The Nuggets fought back and cut the lead to 3 in the final seconds of the game. The refs should've called the foul against the Thunder, as J.R. Smith took his final 3-point shot in the closing seconds of the game. A foul is a foul, REGARDLESS of when it occurs during a game. Nuggets' fans seemed to agree with me, since the "Boos" were very loud and lasted for a few seconds when the game ended. Smith deserved to shoot 3 free throws. He was fouled. The Nuggets had balanced scoring with numerous high scorers with 15 points. Scott Brooks' Thunder squad is definitely gelling and Serge Ibaka was the player that really stepped up his game for the night. Durant led the Thunder with 26. Westbrook contributed 23, and Ibaka added 22. Final score 97-94. The Thunder won. Great all-around game for the Thunder! It goes without saying that the Nuggets have their work cut out for them for Game 4, which is tonight at 10:30PM ET. I went to Denver for Game 3 of the Oklahoma City Thunder v Denver Nuggets game on Saturday. I had never been to the Pepsi Center before and wanted to check the venue off my list. As I went to get my rental car ($23 dollars for about 12 hours), the Hertz driver told me about the Downtown Aquarium - Denver, CO. It was still early, and I had about 3 hours to kill until game time. The driver mentioned that aquarium had tigers (i.e. yes, you read that correctly ~ TIGERS), so I decided to check it out. It cost $7 to park in the aquarium parking lot and my ticket was $16 or $17. **** I'm too lazy to look for my receipt. I'm a huge fan of aquariums. Last December, I checked out the Dallas World Aquarium. Here's a link to the post: http://www.thewirk.com/2010/11/dallas-world-aquarium-easy-like-sunday.html. As I walked into the Downtown Aquarium - Denver, I was immediately surprised that the place didn't smell. Some aquariums have that animal, musty smell and eventually visitors acclimate. However, the Downtown Aquarium didn't smell like an aquarium. I'll admit right now that I love fish. It's one reason why I learned to scuba dive. Incidentally, my dad hates the fact that I scuba dive and has asked me to stop. Oh well, we all can't do everything our parents' ask of us. This aquarium offers you the ability to snorkel/scuba with the fish. The information is in the image below. When I visit aquariums I tend to skip the area where there are birds. I like birds, but I never understood the emphasis on them at aquariums. Although not the largest aquarium it is very kid friendly. There is an area where you can pan for "gold" and pet the stingrays, and feed the animals, etc. My favorite part of the visit had to be the tiger, even though it was sleeping and not too active while I was there. **** I believe the aquarium has more than one tiger, but I only saw one during my visit. Being that I have a cat, I wasn't too surprised that the tiger was taking it easy. I did catch the tiger yawn and stretch. I'll include some of my favorite pictures from my visit in this post. I enjoyed my visit to the Downtown Aquarium but didn't have a chance to eat at the restaurant. The aquarium is located near the Pepsi Center and Invesco Field, so if you're looking for something to do before a game, definitely check it out! Friday night I ventured out to AT&T Park for my second visit. I drove to the Hayward Park Caltrain station and decided to head to the ballpark using public transportation (i.e. rather than fight traffic and pay more to park). Yes, it's true. I'm not a fan of public transportation, but when I travel I like to try to figure out the best way to do these adventures and most of the time, public transportation makes more sense. **** It cost $3 to park at the Caltrain station and the fare was $4.50 each way. I can almost guarantee that it'd cost more than $12 to park by the park, so already I was a winner. Did you know that you could bring your own alcohol and consume it on the train on the way to the baseball game? I didn't. Oh, and if you're underage don't try to get away with it. The train I was on had police on it to make sure people were of age. Further, you're not allowed to consume alcohol or have an open container on the return voyage from the ballpark. It was a short walk to the ballpark from the Caltrain station, and the scalpers I expected were plentiful. For a rookie buyer this can be intimidating, but if you stick to your guns and know what you want, the scalpers respect it. I wanted a premium field club ticket and the scalpers didn't have it. I ended up going to the box office and luckily they had a premium field club ticket for me. As I entered the park, I went to the concession stand and bought food. I then went through the tunnel to my seat. My seat was 3 rows behind home plate (i.e. if you don't count the 3 rows in the Lexus area). FANTASTIC. In between innings, I scooped the $20 Panda hat, that I'd been coveting since my previous visit. I couldn't have been happier, except that the World Champion San Francisco Giants lost to the Atlanta Braves. **** I really don't have a preference between either team, but when I visit a venue I usually root for the "home" team. By the way, did you know that Lou Seal has his own 2010 World Series bling also? Check out the picture! Giants' pitcher, Madison Bumgarner, was relieved of his pitching duties in the 3rd. Tommy Hanson ended up leading the Braves to victory. The final score was 4-1. ﻿﻿The lone Giants' run was scored by my favorite Giant, Pablo Sandoval. So even though, the Giants lost, my evening wasn't a bad experience. In fact, I can't imagine ever a bad time at the most beautiful ballpark I've ever seen! It's been a busy couple of days and now it's Sunday and there are more games on. As I watch the Celtics work the Knicks on TV, I'm editing my pictures from the Atlanta Braves v San Francisco Giants game. I'm also going through my trip to the Denver Aquarium yesterday and Game 3 of the Oklahoma City Thunder v Denver Nuggets series. Yes, I finally made it to the Pepsi Center. I plan to get these posts out tonight or by tomorrow night, so please check back. In the mean time, I'm tweeting at TheWirk. I like the Dallas Mavericks, and I like Jason Terry, but let's make something clear. 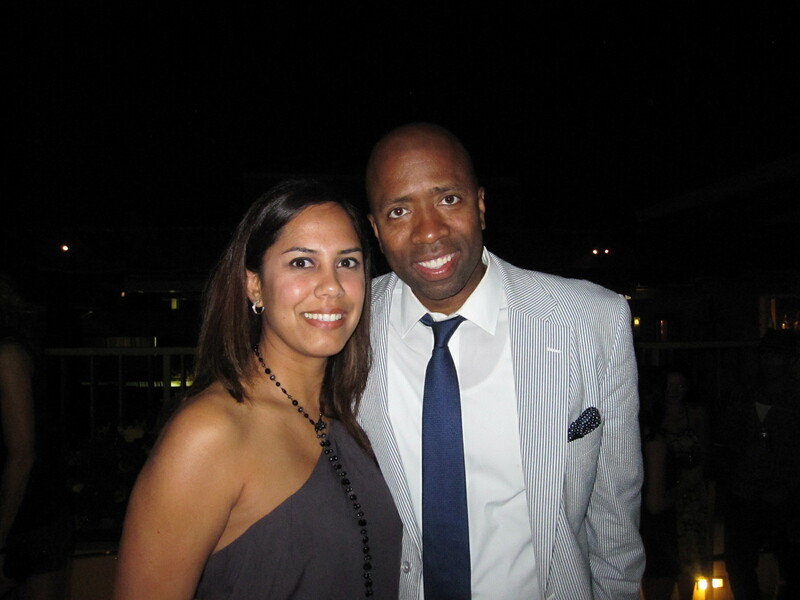 There is ONLY one Jet and it's Kenny "the Jet" Smith. ﻿If you ask me, Jason Terry needs a new nickname immediately. It's disrespectful. Seriously, what's next? Are we going to have another "Dr.", "Worm", "Spider", "Microwave", and "Magic", etc.? I sure hope not! People (i.e. who think this is no big deal) will argue that it's only a nickname. However, I'd argue that what we call a person is very important. Someone's name and nickname help define a person's identity. Honestly, if I was Kenny Smith, I'd be upset about the identity theft. Last night I went to my first baseball game of the season. It was an A's game and my first time at the venue. With a new season upon us and now that the worst is over, I did a quick look and these are the stadiums I have left to check off. With a little planning and some luck scheduling, I'll probably manage five or 6 parks this season. **** By the way, baseball stadium tours don't count. I've had this argument with a number of people, and firmly believe, that you have to watch a game at the venue in order for it to "count". In preparation for the 1st round of the NBA Playoffs, I watched the movie, "Just Wright". It's a romantic comedy, with a sports theme starring Queen Latifah and Common. Queen Latifah plays a character, Lesley Wright, who works as a trainer/rehab specialist. Common is Scott McKnight, the star guard for the New Jersey Nets. **** Did you know I submitted a photo and was selected to be a paid extra for this movie, but couldn't shoot because I had to prepare for a work project? I was being sent out of the country for a customer and need to prepare otherwise, I would've been a part of shooting for 3 days. Talk about a missed opportunity! As I watched the movie, I was amused at how real it is. I've seen how women search and ogle the family/WAGs section of the stands. I've seen the envy in their eyes. I've seen the gold-digging, unscrupulous types try to con players and I've seen players fall for the con. I've sat in the family section for years. It's a quiet sister-hood, for obvious reasons. I found the movie to be funny, since it's the closest the New Jersey Nets are going to get to the NBA Playoffs this year. I enjoyed watching cameos from Dwyane Wade, Dwight Howard, Rajon Rondo, etc. The movie may not have won any awards, but for a girl who loves romantic comedies and sports ~ "Just Wright" was "just right"! Vitaly Potapenko is an Assistant Coach for the Indiana Pacers ~ Who knew? Are my eyes deceiving me or is Vitaly Potapenko really an assistant coach for the Indiana Pacers? Wow. I just saw him sitting behind the Pacers bench. I knew Vitaly back when he was with the Cleveland Cavaliers. The Ukraine Train was very good friends with my first fiancee, and went to college at Wright State University (i.e. where I grew up). When my ex and I started dating, Vitaly was around. I like him. I remember that he got engaged first, then I did, and then Bobby. **** Incidentally the 3 couples who all got engaged never got married and there was one "switcheroo". The stories I could tell, but won't... I should dig up the pictures of the crew back then. It all seems like a lifetime ago! I haven't kept up with the Pacers much this season (i.e. obviously), but I'm very impressed with how well they've been playing against the Chicago Bulls. Over the weekend, I went to Atlantic City and saw the score during the 4th quarter for Game 1 of the Pacers v Bulls series and couldn't believe my eyes. The Pacers were in the lead. Chicago came back to win, thanks to Kyle Korver and Derrick Rose. Game 2 looks like it's following the same script! 23.4 seconds left and the Bulls only lead by 2, 88-90. I had completely forgotten that Victor Ortiz was fighting Andre Berto tonight. I wanted to watch this fight for a couple of reasons. 1) I can't wait for Manny Pacquiao v Shane Mosley and this fight was going to serve as an appetizer, and 2) I have a friend, John, who loves boxing and thinks highly of Berto. I saw a tweet from Dan Rafael and immediately switched from the Portland Trail Blazers v Dallas Mavericks game to HBO for the fight. I'm not going to do a post for the fight, but for those of you that want a summary, here are my (Twitter user: TheWirk) round by round Tweets. The most recent ones are towards the top. Enjoy and catch the replay, if you can. It was a good fight! i have #ortiz winning and beating #berto. announce the winner so i can go back to basketball #blazers v #mavs! it's the 5th & #ortiz has #berto on the ropes again. announcer says, "berto is fighting this fight like he needs one fight to change it all"
i think berto better wake up... #ortiz looks like he has more fight in him now... pun intended. oooh ~ #berto just knocked down ortiz! #ortiz knocked down #berto already... 1st round. Mike Green was back in action, as the Washington Capitals took a 1-0 lead in the 1st round playoff series v the New York Rangers. The Caps goals were scored by Alex Ovechkin and Alexander Semin. **** Matt Gilroy had the goal for the Rangers. It took overtime, but the Caps were victorious at the Verizon Center. Incidentally, I watched the game on TV and saw Wheel of Fortune's own, Pat Sajak, at the game. A Tweep told me that Sajak is from Maryland and might even be a season ticket holder. That's semi-correct. I checked his bio, and he was born and raised in Chicago, IL. He splits time between Maryland and California. Who knew? Game 2 of the series is in Washington, DC on Friday at 7:30. Last night I was catching up with a friend and was pointed towards Jay-Z's new blog, Life+Style. The link to the blog is: http://www.lifeandstyle.com/ and it's hot. Then again, I pretty much like everything Jay-Z does. I'm a huge fan. As I was clicking away on his blog, I was impressed by the design and content on the site. I was also reminded of Jay-Z's $50,000 fine from the NBA for being in the University of Kentucky locker room during this year's Final Four. 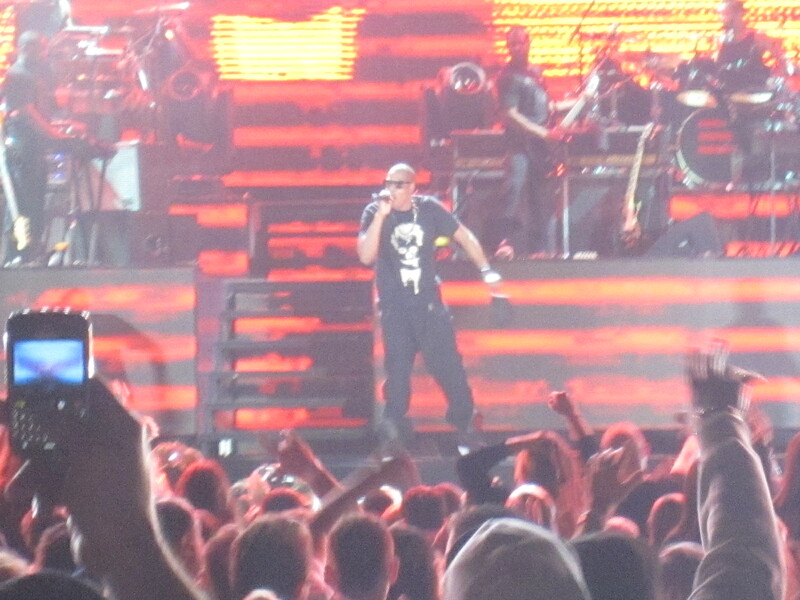 ﻿Jay-Z has been to numerous basketball games and events. Although I've never seen him at any collegiate events, I'd be willing to bet that the Final Four wasn't his first rodeo. ﻿Of course Jay-Z knew he shouldn't be in the Kentucky Wildcats' locker room, but we all know that $50,000 is NOTHING for the New Jersey Nets' Russian billionaire owner, Mikhail Prokhorov. I guess the NBA had to do something, but this fine just made me smile. I'm a betting woman. What do you think? Do you think Brandon Knight ends up in New Jersey? If I was Prokhorov, I'd ask Jay-Z do all my recruiting. It's GENIUS. In reality, I guess only the ping pong balls know where the Nets will pick in the NBA draft but it never hurts to have Jay-Z affiliated (i.e. minority owner) with an organization when it comes to recognizing and signing talent. Today, I received notification that one of the tickets I have for the Shane Moseley v Manny Pacquiao sold on StubHub. About a week ago, I saw a commercial for the upcoming shows on Showtime about the fight (i.e. that is less than a month away on Saturday, May 7 at the MGM Grand Garden Arena). Yes, folks... The boxing match is quickly approaching. I can't believe the fight is less than a month away. Today, I saw on Twitter that Bob Arum said the fight is a sell-out. I'm not sure how that's true though, since I went on Ticketmaster to check if I could pull another ticket (i.e. and I could). At any rate, I'm ready to go. I have my tickets. 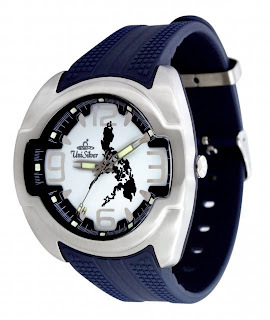 Further, in anticipation of the event, I even bought some Unisilver watches that feature the Philippines on the face. I'm not familiar with the brand, but when I saw the rubber watches posted on Emma Camacho (i.e a family member's page), I had to have a couple for the fight. **** She's on Facebook, if you want to check out what she's selling. She ships internationally. I like my new watches, but I like money too. I may even re-sell the fun timepieces in Las Vegas. You never know! If you want to show your Philippine pride and you're interested in any of the watches, please let me know. Maybe we can do some business! Aren't the watches fun? I can't wait to sport one at the fight. If you've never been to a Pacquiao fight it definitely is a cultural event. Yesterday most of my friends were excited for one thing only. Club Glow brought Tiesto's Club Life Tour to the DC Armory last night. It was an 18+up show, and that normally makes my friends hesitate. However, the chance to dance and be a part of the crowd of 10,000+ for Tiesto's largest US show (i.e. minus festivals), were opportunities that couldn't be passed up. **** It's my understanding that this was an attendance record for a US show (i.e. minus festivals). I used to date a guy that loved all things Tiesto. Some people followed sports and Michael Jordan. He was all about Ministry of Sound and Tiesto. **** I think it's because he spent a lot of time vacationing internationally. Some people vacation in Las Vegas and Florida. He went to the Full Moon Party in Thailand and partied in Ibiza. I once listened to "Beautiful Things" by Andain and Tiesto over 50 times in one day because it was he and his roommate's favorite. If you haven't heard the tune, where have you been?!?! Here it is for you to check out, since I mentioned it. I haven't been as familiar with the club scene, since Jason and I broke up many years ago. Let's face it ~ I'm not the girl you'll find running around Winter Music Conference, but every now and again you will catch me at a place where Tiesto is spinning. The last time I saw Tiesto was in 2008, and I can STILL FEEL the heat from all the bodies dancing. Surprisingly, I think since the doors were open for the loading docks etc, the Armory was kept cool enough for last night's show. To be expected, the crowd grew as the night went on, with Goldman doing the hardest work revving up people who arrived early. Roberto Gonzalez followed up the heavy-lifting. **** I actually left during part of his set to run over to RFK Stadium to see David Beckham. By the time I returned to the Armory, Cedric Gervais was playing to about 75-80% of a full house. Gervais was killing it, and he definitely had the crowd riled up for Tiesto to come out. Around 10:30 the Tiesto chants started. Tiesto came out and did his thing. My friend, Giselle, posted the Tiesto remix of "Girls with Bangs" by Lune, on her facebook profile. When it came on I know she was thrilled! Here's the tune, if you want to check it out. 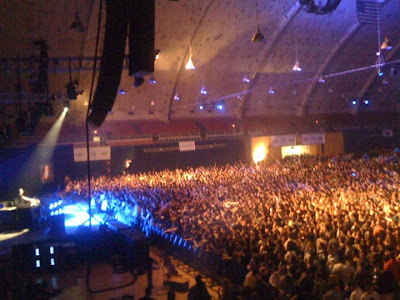 The crowd of 10,000 plus people at the Armory was treated to a spectacular show. I was excited to be part of the event, especially since it was my first time at this particular venue. Later in the evening I found myself next to Goldman with Gervais and Gonzalez behind me, while Tiesto was on stage. Yep, that's how it should be!